Taherifar, Z., Frdowsi, S., Mootabi, F., Mohammad-Ali, M., Fata, L. (2016). Emotion regulation therapy for generalized anxiety disorder comorbid with Major Depressive Disorder: A case study. International Journal of Behavioral Sciences, 10(1), 60-65. Zahra Taherifar; Sima Frdowsi; Fereshteh Mootabi; Mazaheri Mohammad-Ali; Ladan Fata. "Emotion regulation therapy for generalized anxiety disorder comorbid with Major Depressive Disorder: A case study". 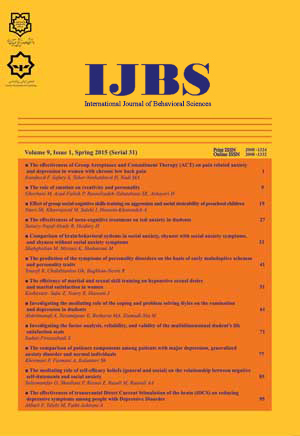 International Journal of Behavioral Sciences, 10, 1, 2016, 60-65. Taherifar, Z., Frdowsi, S., Mootabi, F., Mohammad-Ali, M., Fata, L. (2016). 'Emotion regulation therapy for generalized anxiety disorder comorbid with Major Depressive Disorder: A case study', International Journal of Behavioral Sciences, 10(1), pp. 60-65. Taherifar, Z., Frdowsi, S., Mootabi, F., Mohammad-Ali, M., Fata, L. Emotion regulation therapy for generalized anxiety disorder comorbid with Major Depressive Disorder: A case study. International Journal of Behavioral Sciences, 2016; 10(1): 60-65. Mennin DS, Fresco DM. Emotion Regulation Therapy. In: Gross JJ, editor. Handbook of emotion regulation. 2nd ed. New York: The Guilford Press; 2014. p. 469-90. Kessler RC, DuPont RL, Berglund P, Wittchen H-U. Impairment in pure and comorbid generalized anxiety disorder and major depression at 12 months in two national surveys. American Journal of Psychiatry. 1999;156(1915-1923). Fresco D, Mennin, D. S., Heimberg, R. G., & Ritter, M. Emotion Regulation Therapy for Generalized Anxiety Disorder. Cognitive and Behavioral Practice. 2013;20:282-300. First MB, Gibbon M, Spitzer RL, JBW. W. Userâs Guide for the Structured Clinical Interview for DSM-IV-TR Axis I Disorders-Research Version (SCID-I for DSM-IV-TR, November 2002 Revision). New York: Biometrics Research, New York State Psychiatric Institute; 2002. First MB, Gibbon M, Spitzer RL, Williams JBW, Benjamin LS. Structured Clinical Interview for DSM-IV Axis II Personality Disorders. Washington, DC: American Psychiatric Press. ; 1997. Mennin DS, Fresco DM. ERT 2.0 therapist manual. 2013.